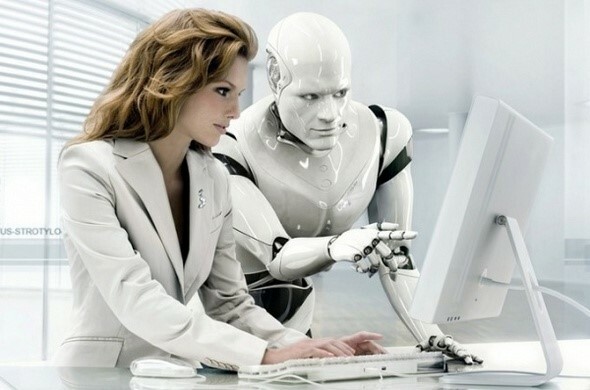 Machine Learning is being adopted by more and more companies to assist in the sales process. Like all technology, Machine Learning is not correct all of the time. In fact, models with 75% accuracy are commonly accepted as good models and implemented for production. This means 25% of the time the model is wrong, meaning that the algorithm will incorrectly flag 25% of the business. What happens to transactions where an algorithm has incorrectly determined the transaction is not viable? Legitimate business is turned away. This happened to me when I tried to do business with Lenovo. Lenovo’s Ordering System: No Laptop For You! 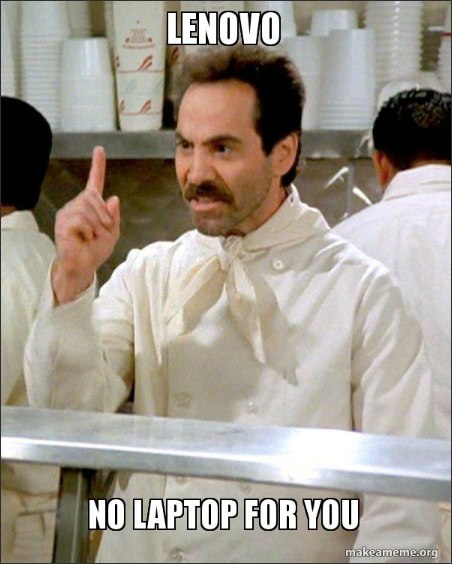 Buying a laptop from Lenovo reminded me of an episode of Seinfeld when Elaine was trying to buy soup. 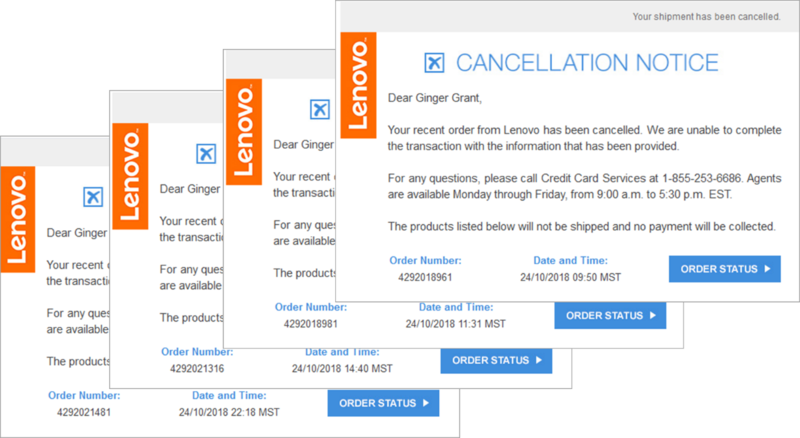 For some unknown reason, when I placed an order on their website and gave them my money, Lenovo gave me a Cancellation Notice, the email equivalent of “No Soup for you!” After placing an order, about 15 minutes later, I received a cancellation notice. I called customer service. They looked at the order and advised me the system incorrectly cancelled the order. I was told to place the order again as they had resolved the problem. I created a new order, and just like the last time, I received the No Laptop for You cancellation email. I called back. This time I was told that the system thinks I am a fraud. Now I have no laptop and I have been insulted. I asked if the system could be overridden because I was not a fraud. Customer service verified my method of payment and told me that were going to assign a case number to it as that would ensure the transaction would go through, and they would get credit for the order as they were going to place it. Apparently, customer service has some kind of financial incentive for placing sales. That did not work either as, once I again I received the No Laptop for You cancellation email. Not only did I not get a laptop, the person I spoke to also lost out as he was not going to get a credit for the sale. I called back again and this time they told me that they had no idea what was wrong with the system but it had flagged me as a fraud and a case number did not get assigned last time as it was supposed to, which was the reason that that order was canceled, again. They placed the order again and once again I received the No Laptop for You cancellation email. Every attempt at buying a laptop had failed. I had struck out with customer service as had received advice 3 times and every time I got a No Laptop for You cancellation email. At this point I tried getting the situation resolved via social media. Publicly Lenovo said they wanted to help, and sent me one direct message letting me know they would fix the system, and that was the last I ever heard from them. By not sending me another email, the message they sent me instead was No Laptop For You! I tried to give Lenovo nearly $2000 and they refused to take my money. How many other transactions are they ignoring? Over 500? That does not seem like a terribly high number. 500 transactions for $2000 a piece would mean Lenovo’s sales are needlessly down 1 million dollars because they implemented a system which turns away sales and actively prevents sales despite the best intentions of their employees to close a sale. Blindly relying on the accuracy of a computer program to determine with 100% accuracy whether or not a transaction is viable or not is not just a bad idea but is a bad business decision which can cost millions of dollars in sales. While you may not have been rejected to buy a product, most people I know have seen lists of recommended products on websites which do not reflect things you want to purchase. A friend of mine who was remodeling a bathroom, bought a toilet seat on Amazon. When he logged in again, he continued to see a myriad selection of toilet seat product recommendations for the next six months at the exclusion of other products he might actually want to buy. Apparently, the machine learning algorithm determined that because he bought one toilet seat, he was a Toilet Seat Connoisseur and wanted to decorate his house with a variety of rare and unusual of toilet seats for the next six months. I create machine learning solutions for clients and provide training sessions to help people learn how to write machine learning models. I understand the process and the steps which are used to create a machine learning experiment. First you gather and clean the data, then train it using a set of algorithms against a set of data, and then you create a model. The problem “Should I cancel this sale” is has two possible answers, yes or no, meaning it is a binary classification for anomaly detection. Never have I created a model which was 100% accurate as that is not possible. I tell clients that is not possible and help them implement solutions to handle conditions when the model is wrong. Machine Learning needs to work in concert with people who have the ability to resolve problems which are flagged by the system, as there is a place for people in all automated systems. Most normal people would have probably given up after their order was canceled twice, but I persisted as I was amazed that such a big company like Lenovo could continue to be so wrong, and I wanted to prove I was not a fraud. Continued failure to successfully place an order convinced me that I did not want to do business with Lenovo. If a company does not want to resolve an issue where they will receive money, how likely are they to want to resolve a situation which costs them money, such as a warranty claim? Based on my experience, I have no confidence that one could get Lenovo customer service to solve a problem as they do not have the ability, even when they are financially incentivized to do so. Machine Learning and AI may decrease the number of people needed, but when things go wrong people are needed to fix them. When a machine learning model is wrong, and this will happen, the policy should be to permit your customer service people to create successful sales. If instead, your customer service insults and ignores customers when machine learning models go wrong, sales will go down as customers will be going to competitors. I researched laptops as I was interested in having a lightweight powerful laptop which I could haul through various airports to use at clients and conferences, like Live 360 SQL Server where I will be speaking on December 3. Fortunately there are other companies who have determined they do not need to create some kind of machine learning score to sell a laptop, they just sell laptops to people who go to their website and give them money with no problems. Using the same address and credit card information which Lenovo flagged as fraudulent, I bought my new HP laptop, which I will be happy to demonstrate next time you see me at a conference or class. This is my last installment in my series on improving Analysis Services Tabular. If you want to start at the beginning, please click here. I started writing this because I wanted one place to point clients to improve the performance and scalability of Tabular Models, and there are a lot of places you need to go to find all of this information. I hope you find it helpful. Let me know if you have any questions or comments regarding this post I hope you leave some comments or perhaps ask me a question on twitter. With that here are more things that you need to do to improve your Analysis Services Tabular implementations. While it is not easy to performance tune DAX you can do it, by evaluating the DAX Query Plan and VeritPaq Queries, and SQLBI’s VertiPaq Analyzer. Also, you can also look to use functions which perform better, for example COUNTROWS instead of DISTINCTCOUNT or ADDCOLUMNS instead of SUMMARIZE. Whenever possible use the CALCULATE function instead of the FILTER function, as CALCULATE filters for context inside the parenthesis and are more efficient. Also all of the iterative functions SUMX, COUNTX etc., should be used sparingly as the row-by-row transactions they create are less efficient and should be used only when SUM or COUNT will not work. When evaluating if a value missing, if it is possible, use ISEMPTY instead of ISBLANK as ISEMPTY looks only for the presence of a row, which is faster than the evaluation performed by ISBLANK. There are times when the sort needs to be specified as something other than alphabetic. A common place where this is done is for months, as people want to see January appearing first rather than April. April will appear by default as the dates are sorted alphabetically. To change this, modify the Month Name column property Sort by Column to sort by the Month number field so the months will always appear with January first. This process should be repeated for any column where the alphabetic sort is not likely what people want to see, such as Day of Week. All values should be formatted in a way that will look good on reports. Most of the time this formatting has been included, but there are some instances where the general format is used instead. Most users want numbers which include a thousands separator. In analysis services tabular, this is accomplished by using a custom format and the format style #,##0. This will add the thousands separator when needed and will never show a decimal number. All values not used in a report should be hidden. This will make things less confusing for people who are writing reports as the values that appear are ones which they actually use. For purposes of joining tables, many times you need to bring in key values to create relationships, but they are not values which should be reported upon as they have no business meaning. When creating Power BI reports, the column names in the table are the names used in the reports. As a best practice, the names in the tabular model should be business friendly names. All of the column names visible in the model should be names which can be readily understood by anyone reading the report. Names should include special characters like spaces and should be appropriately capitalized in the normal function names appear. For example WK_NUM would appear as something like “Week Number” would be understandable to the user and look appropriate on reports. Using views can also provide the ability to change the names to user readable names outside of the model, which is also considered a best practice as then the model does not need to be changed to have user specified names.